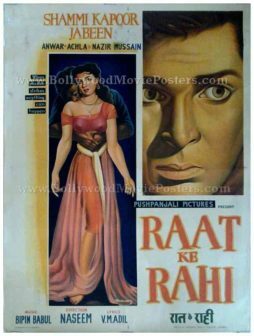 Extremely rare hand painted original vintage Bollywood movie poster of the classic Hindi film, Raat Ke Rahi (1959) for sale. This is an actual surviving publicity poster of the 1959 old Bollywood movie which featured the “Elvis Presley of India,” Shammi Kapoor in the lead role. Raat Ke Rahi was among one of the early Bollywood movies to be made with a Christian centric theme, making this poster highly collectible! 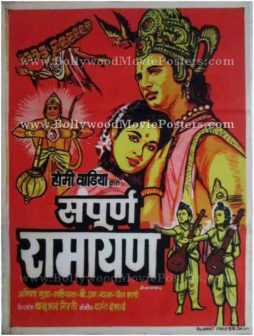 Printed and circulated during the first release of the film (somewhere in the late 1950s), this old hand painted Bollywood poster was originally designed for publicity of the film but never ended up being used. 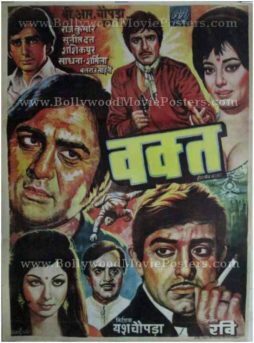 This poster was originally hand painted on canvas by a leading Bollywood movie poster art studio, making it very collectable. 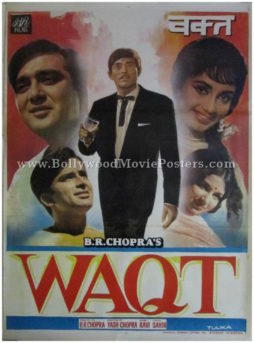 The poster features a stunning close up portrait of Shammi Kapoor. Lead actress Jabeen appears in a smaller hand painted portrait alongside wearing a bullet bra. Raat Ke Rahi was an adaptation of Daphne du Maurier’s novel Jamaica Inn and was shot in Goa.